Today’s pickups are vast, hulking bison, striding across the automotive plain. They make the tiny trucks of the ‘80s look like tiny little rattle cans. And yet, according to a new EPA report, both get just about the same mileage. Basically, modern trucks are far more efficient than before, but thanks to their bigger size and weight gains, it’s almost a wash. The trick here is that we’re talking about numbers pulled from the total figures of trucks we’re buying. 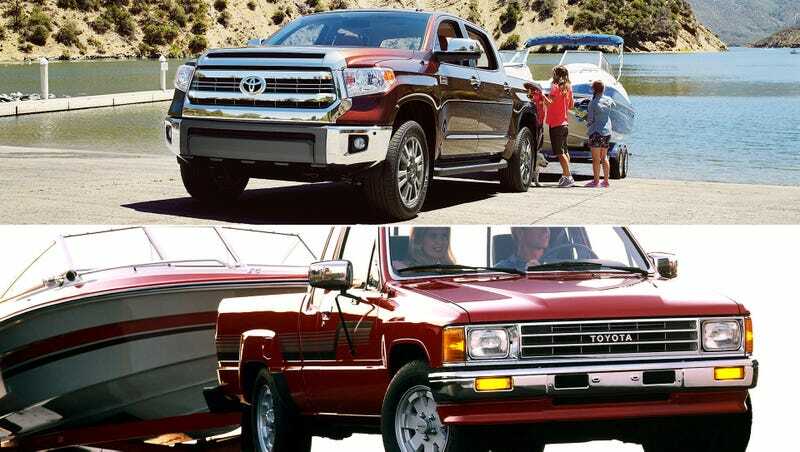 On an individual level, if you were facing an imminent nuclear explosion, and in front of you was a 2016 Toyota Tundra and a 1986 Toyota Truck each with a gallon of gas in the tank, you would probably get farther in the oldie. But even in the worst truck-to-truck comparison, they’re not off. Poke around on the numbers and you’ll find that truck mileage is not too far off even with today’s full-sizers compared to the trucks of thirty years ago weighing a third less. As for which one I’d want to be in if I was in a crash, the progress there is much more pronounced.